Rhinos, elephants, and the many other beautiful and exotic creatures who are killed for their horns and pelts are pretty much defenseless when it comes to poachers. That is, except for when their would-be murderers' plans get thwarted by a crew of protective beasts like the pride of lions who recently ate a trio of rhino poachers who snuck onto a South African nature reserve. 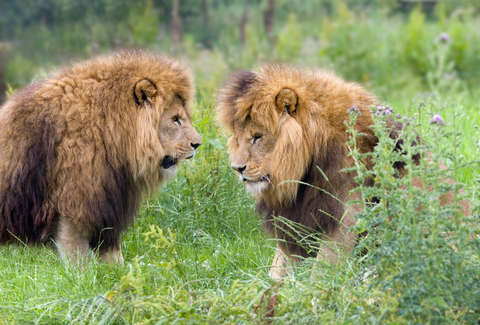 This king of the animal kingdom-sized dose of karmic justice was doled out earlier this week on the Sibuya Game Reserve in South Africa, and discovered by a staff member who came upon human remains near a pride of six lions. After an investigation by the reserve's anti-poaching unit, it was determined that the remains -- along with shoes, wire cutters, and weapons found at the scene -- belonged to at least three poachers who'd broken into the reserve with ill intent. It's believed they were there to specifically kill the Reserve's rhinos, since among the possessions they found both high-powered rifles and a type of ax often used by poachers to remove the animals' horns. Before the site could be adequately combed through, the lions had to be tranquilized because they were milling about the area, but are unlikely to be punished for what they did. Sibuya's owner, Nick Fox, is understandably very grateful to the majestically maned cats for saving his rhinos, especially considering he's experienced poaching before on the reserve. Rhino poaching is a huge issue in the area, and three were killed for their horns on a nearby reserve as recently as this Spring. "It is huge relief that they did not get to the rhino. We had a poaching around this exact same time two years ago,” Fox said in an interview with South Africa's Herald Port Elizabeth. Police also said they will further examine the remains, and do a ballistics test on the recovered weapons to see if they can be linked to any other poaching incidents. And while it's tough to find the bright side to any human life being ended so abruptly, it's hard not to see this as the universe intervening to right what would have been a very big wrong.